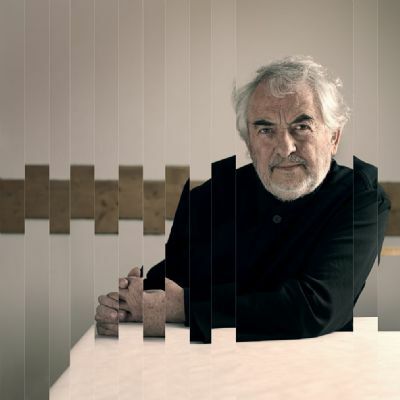 Daniel Buren is an internationally celebrated, critically acclaimed conceptual artist. Often termed an abstract minimalist, Buren interrogates the relationship between art and space by prioritising the positioning of the artwork. The artist’s signature motif is the vertical stripe measuring 8.7cm wide, created using different colours but always alternated with white. Working site specifically, Buren uses the stripe as a visual tool to draw attention to a space, building or site. The artist challenges the concept that the art object is independent of its surrounding context. Working exclusively with the stripe, he has created pieces for gallery spaces and historical landmark sites as well as incongruous locations for art. Buren’s work is about the act of looking. We are made aware of our position as viewer and our relationship to a particular physical space. His work both defines, and is defined by, its context. Painting, architecture and sculpture combine in expansive installations of beauty and criticality. Buren has been included in over two thousand exhibitions across the world in a career that spans over forty years. The artist has received numerous notable accolades. He was awarded the Golden Lion Award in 1986 after representing France at the Venice Biennale. 1991 he received the International Award for the Best Artist in Stuttgart, Germany. A year later he was presented with the Grand Prix National de Peinture in France. He holds the prestigious Japanese award the Praemium Imperiale, awarded to him in 2007. Buren’s work is included in a number of major museum collections including the Museum voor Hedendaagse Kunst, Antwerp; Musée d'Art Moderne de la Ville de Paris; Tate Modern, London; the National Museum of Modern Art Tokyo; Guggenheim Museum, Bilbao and Moderna Museet, Stockholm.